As long as the weather’s not awful I’ll be playing a one-off show on Clapham Common this Sunday (22nd July). It’ll be an unplugged, picnic style affair and you should come. Here are some details. 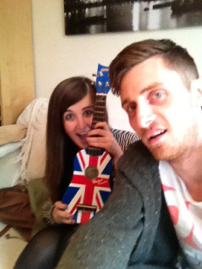 It all started on Monday when I was due to meet Lauren Aquilina and maybe do some writing. Lauren’s a singer/songwriter from Windsor but that doesn’t stop her using words like ‘bredrin’ on Twitter! She’s also only 17 years young (how depressing – makes me feel old! ), has already built up a massive Youtube following and can play piano far better than I can. Annoying! We met at the tube station, grabbed a couple of Caramelatte’s and headed back to #onesongaweek HQ. On the way I thought I’d confess that I’d been forced to commit genocide on two counts already that morning – Flies (several dozen) and Spiders (two). Lauren seemed unnerved and the ice had been broken. A good start. We spent a while playing ukelele and Lauren explained to me exactly what an ‘Aquaslut’ is before we moved to the business end of the lounge (the studio) and sat down with a guitar and a piano. I’d already had a lyric idea (which has now become the title) and we set about playing around with some of my old verses that needed new choruses. You’ll notice this weeks song has a much ‘bigger’ production than usual. Obviously I’m not a producer (I’m a blagger) so I’ve been a little nervous about it all – not least because this is the first time in the whole of #onesongaweek that I’ve attempted to play play ‘proper’ bass and tried to program ‘proper’ sounding drums. Despite my initial concerns this weeks song has been SO much fun to work on. Having a bass in the house is awesome (thanks @alexkarban for donating his spare) and from the ukelele’s to the guitars I’ve enjoyed every bar. My ears are absolutely fried and I’m sure my neighbours hate me even more than they usually do on Thursdays but I’d do it all over again… Like I have a choice!! If every week’s this fun then the next 23 will be a breeze – it’s not only on the production front that I’ve been setting personal bests (lame Olympic reference). The first two verses of this song have been written for around a year and a half but I’ve never been able to find the right chorus. That’s happened with a few songs and I’ve never, ever been able to settle on a chorus that does justice to any of them… Until now!! I know I’ve only lived with this for a few days (and had it recorded for a few hours) but already I’m thinking about how it’s going to sound on the album! the best days are the ones I spent with you. but the bestest thing I’ve ever had was you”.